As we grow older, it seems that most of us lose our childishness – we become more mature and less capable of being spontaneous, unselfconscious and cheerful. All those fascinating creatures who lived only in our imagination disappear and we are forced to get into the world of adults. However, there are still people who didn’t lose much of the childhood fascination for excitement and curiosities. 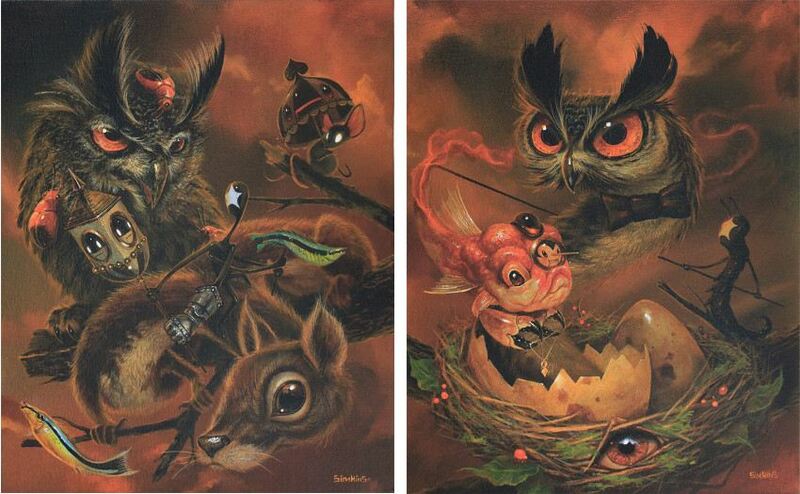 One of them definitely is the American painter, graffiti artist, and illustrator Greg Simkins, also known as Craola. Born in 1975 in Torrance, an affluent city in the South Bay region of Los Angeles County in California, Craola makes artworks that take us into the worlds that we, unfortunately, lose when growing into adulthood, when responsibility takes over, forgetting the miraculous places we created in our imagination. Greg Simkins began drawing when he was only three years old inspired by various cartoons and books including Watership Down by Richard Adams, The Phantom Tollbooth by Norton Juster, and The Chronicles of Narnia by C.S. Lewis. 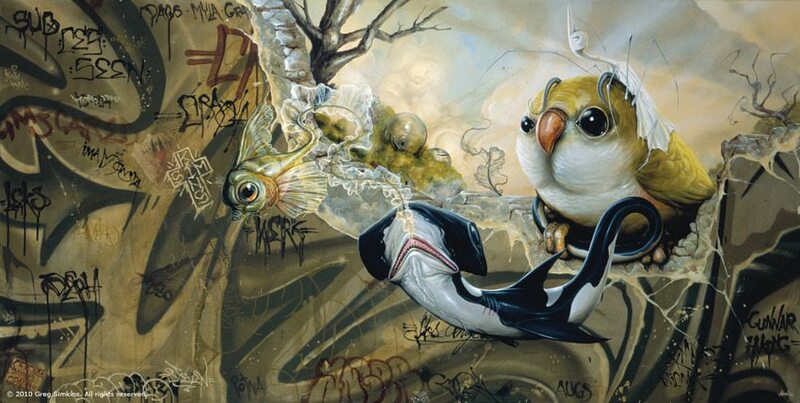 At the age of 18, Greg started doing graffiti under the name “Craola”. Graffiti taught him perspective, composition, and color theory so he turned to large-scale works while further developing his artistic skills. Simkins received his BA in Studio Art from California State University, Long Beach in 1999. After graduating, Greg worked as an illustrator for different clothing companies and bands, but also worked on video games. 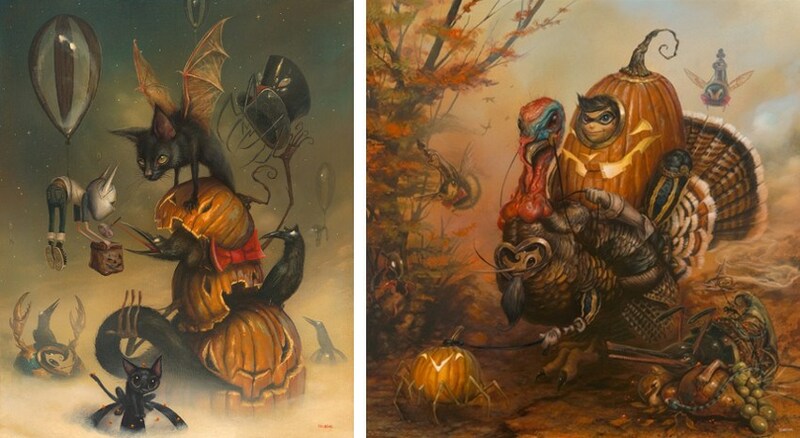 Greg Simkins became a full-time artist in 2005. His paintings display wonderful mythical landscapes, full of weird creatures that occupy those long forgotten dark corners of the mind. His instantly recognizable surreal subjects are painted with such skill that their lack of reality is completely natural. Out of his love for the animal world he seeks to bring together unlikely friendships and conflicts including deer with killer whales, puppies with crustacean pals, and birds sharing the air with rodents. IMSCARED and I’m Scared: The Movie! IMSCARED is Greg Simkins own brand of clothing, merchandise and accessories developed in 2009, to further expand Craola’s art into more everyday mediums that can be worn and enjoyed by his diverse fan base. I’m Scared: The Movie! is a stop-motion short film based on Greg Simkins’s work. The story of two brothers, facing the things that go bump in the night, are filmed in collaboration with director Pete Levin, whose credits include IFC’s Comedy Bang Bang and Cartoon Network’s MAD. The film was funded by a substantial Kickstarter project. Simkins’ artworks can be found in the collections of many celebrities including the film director Nick Cassavetes, Grammy award winning singer-songwriter Everlast, singer Fergie, actor Josh Duhamel, CEO of Nike Mark Parker, Lead Singer of Good Charlotte Joel Madden and numerous others. 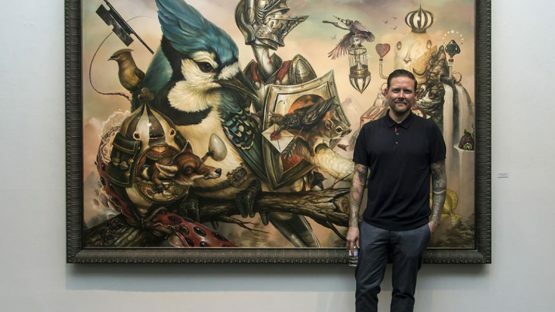 Craola’s commercial client/collaboration list includes Disney, Pearl Jam, Linkin Park, Juxtapoz, Mattel, Logitech, Converse, Pulse International, Eddie Vedder, Blink 182, Upper Playground, to name a few. Greg Simkins’ art can also be found in a wide variety of industries from clothing to video games and it has come to life in the form of toys. Simkins’ work has been included in numerous individual and collective shows throughout the United States and beyond. One of his latest solo exhibitions took place at the KP Projects. Titled Where am I, it was Greg’s fourth solo show at the Los Angeles Gallery; his earlier exhibitions at the space devoted to exhibiting contemporary works of art that are challenging, innovative and committed to fostering new directions in American art, include Good Knight (2014), Greg Craola Simkins (2013), and Cloud Theory (2012). In 2011, Simkins had his curatorial debut with INLE at Gallery Nineteen Eighty Eight, a show in which he also participated. 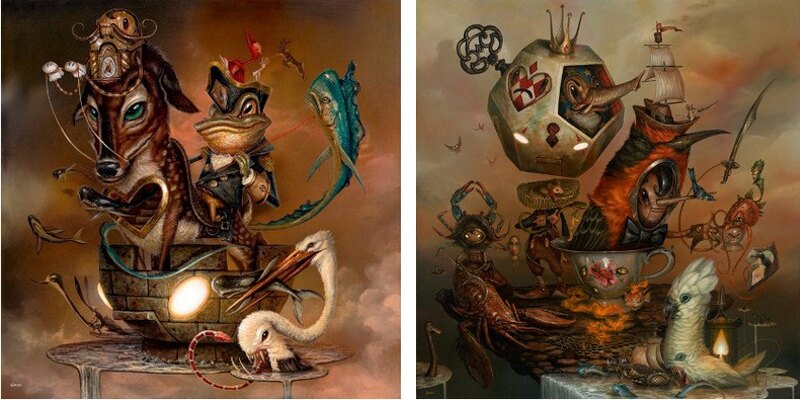 Widely recognized for his highly imaginative and surreal works, Greg Craola Simkins explores pop surrealism through fine art. He has created his own universe called “The Outside”. Much like the other worlds we have had glimpses of such as Narnia, Neverland and Middle Earth, he has created his own place to inhabit, escape to and daydream about. It is full of heroes and villains, and similar creatures beyond imagination who are still waiting to be invented. All those things that excited us as kids, Greg Simkins attempts to get back through working on this world. The artist is represented by KP Projects (formerly known as Merry Karnowsky Gallery). Greg Simkins lives and works in Torrance, California.